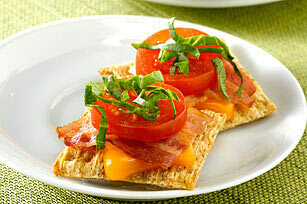 Imagine the flavor of your fave BLT sandwich transformed into a bite-size appetizer cracker. Then head to the kitchen and make that dream a reality. Cut each cheese slice in half. Top crackers with cheese, bacon and tomatoes. Place 8 topped crackers on microwaveable plate. Microwave on HIGH 20 to 25 sec. or until cheese is melted. Repeat with remaining crackers. Substitute 2 Tbsp. OSCAR MAYER Real Bacon Recipe Pieces for the chopped fully cooked bacon. Spread each cracker with 1/4 tsp. KRAFT Mayo Chipotle Flavored or Horseradish-Dijon Flavored Reduced Fat Mayonnaise before topping with cheese, bacon and tomatoes and microwaving as directed.